(Mens M) Ugly Xmas Sweatshirt! Mickey Mouse Santa! Ho Ho Ho! Ha Ha Ha! Home > Ugly Christmas Sweaters > All Ugly Xmas Styles > (Mens M) Ugly Xmas Sweatshirt! Mickey Mouse Santa! Ho Ho Ho! Ha Ha Ha! Vintage ugly Christmas sweatshirt! 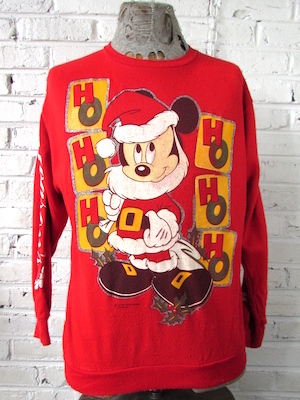 Red sweatshirt with puffy paint Mickey Mouse dressed as Santa on the back & front of the sweatshirt! 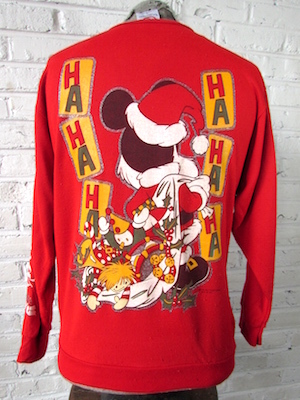 The front of the sweatshirt shows Mickey Santa with a sneaky look in his eye and reads Ho Ho Ho in big yellow blocks. The back of the sweater reveals that Mickey Santa has a big bag of toys with Ha Ha Ha written in the yellow blocks. The right sleeve reads "Seasons" and the left sleeve reads "Greetings". Has silver glitter accents throughout the sweatshirt! Tagged by The Walt Disney Company. 100% Acrylic. Condition: Very Good. A little cracking in the puffy paint and fading in the print. Also has a little bit of pilling. Does not detract from the awesomeness of this sweater!